Today, I'm excited to share my project for Craft Book Month at Craft Buds. Since it's the beginning of September, you have plenty of time to join us and create a project from any craft book for a chance to win some awesome prizes! The project I made is from the new book "Little One-Yard Wonders" by Patricia Hoskins and Rebecca Yaker (Storey Publishing). 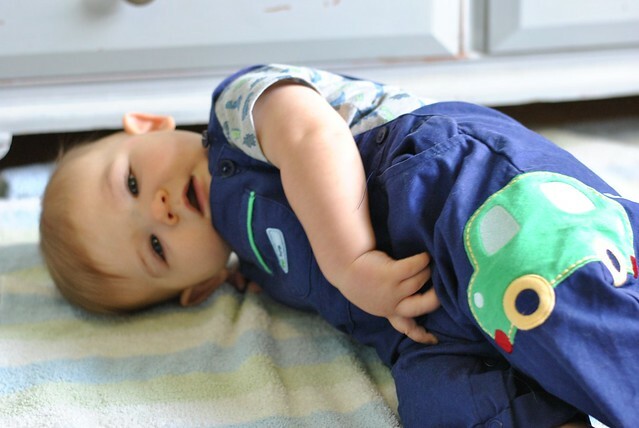 This book is all about sewing for babies and kids. I'm so honored to have contributed a project to this book, which is pictured above. My Fabric Photo Blocks are soft toys I designed to hold photos of family and friends (or even flash cards), and I used a cheater print of Wonderland by MoMo. I also had a project in the previous "One-Yard Wonders" book, which was my Hugh Manatee. 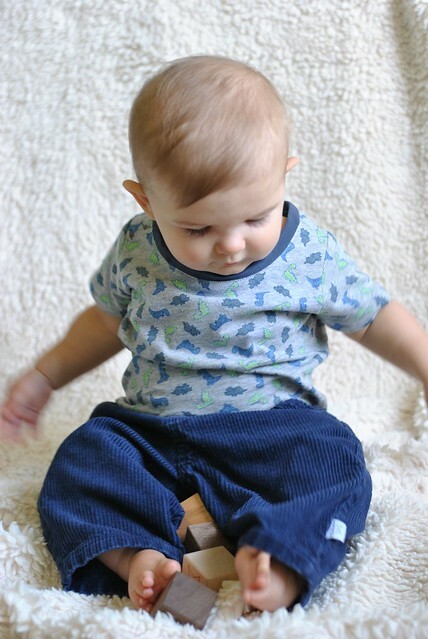 When I saw this cute Long Beach Tee in the new book, I immediately wanted to sew it for Elliot. This dinosaur jersey fabric is a print I picked up on a clearance rack locally when he was itty bitty. 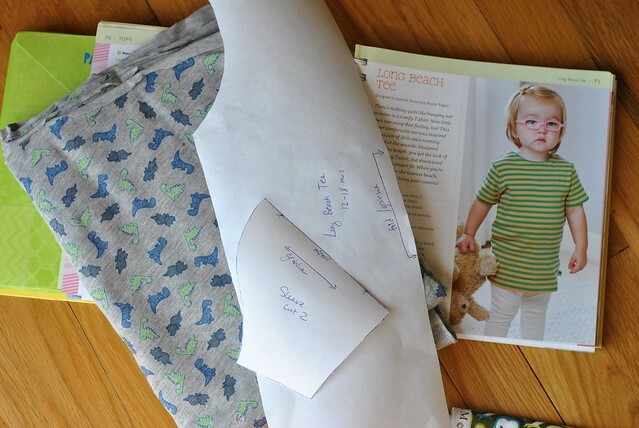 I followed my favorite method for transferring a sewing pattern with freezer paper and got to work! 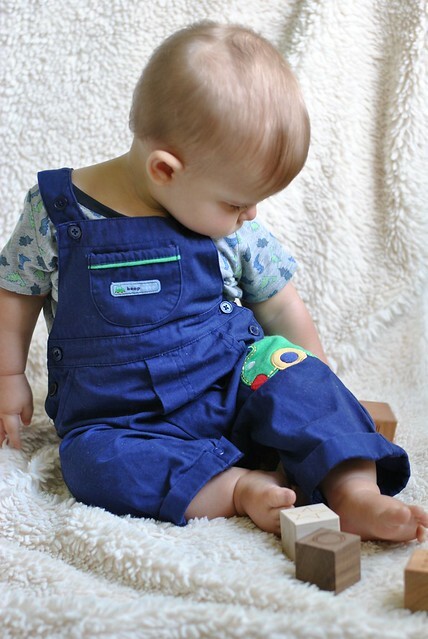 I chose the 12-18 months size, thinking it would be really big on him. In reality, it fits just about right (he's 7 months), but I had to increase the size of the neck hole a TON. I know my boy has a big head, but the neck is really too small for my taste. I altered the pattern so the hole was not only larger, but made sure that it dropped down deeper in the front than the back. (The pattern keeps the front and back of the shirt exactly the same.) I also cut a contrasting neckband from a pair of pajama pants I was going to toss out. Win! The total time it took me to sew the shirt was under 1 hour. Granted, I had to pre-wash my fabric, find/trace the pattern, and cut out fabric and make some alterations. But I would definitely make this pattern again, now that I have it all ready to go! This would be a great project for repurposing old T-shirts and keeping them in the family. I made another project from the book, so I'll be back to share that next Monday! September marks the 4th Annual Craft Book Month at Craft Buds! This year, we're excited to celebrate all month long with a blog hop of inspiring craft book projects and LOTS of giveaways for sewing along with a sewing, knitting, cookbook or other craft book of YOUR CHOICE. 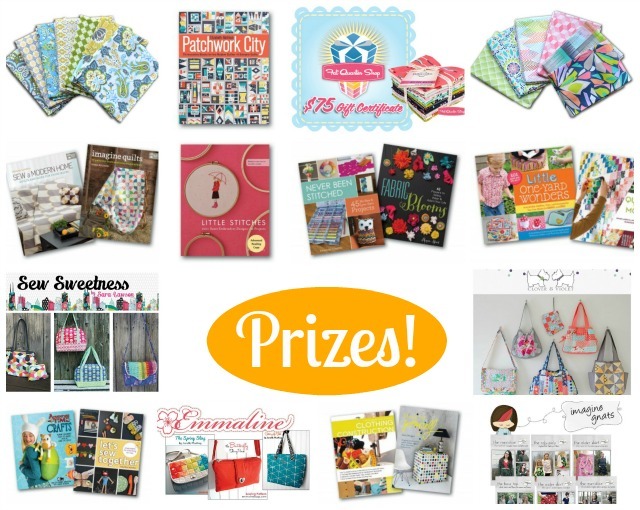 2014 Craft Book Month Blog Hop! I've teamed up with some fabulous bloggers who will be showing off their projects made from craft books, all month long! 9/1-9/30: Link up your craft book project at Craft Buds from your blog or Flickr account, and enter to win prizes. 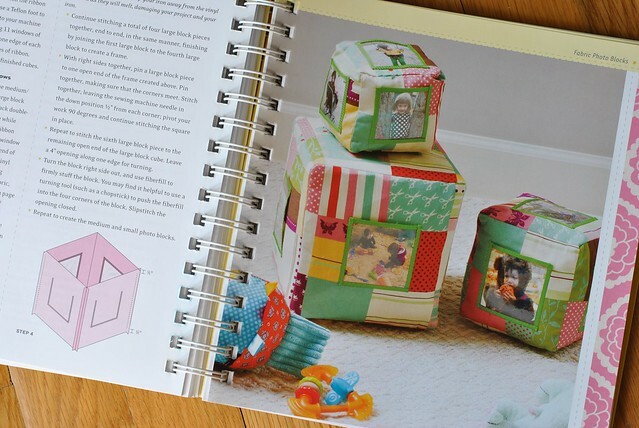 To participate in the month-long contest, just link up any project you've made from a pattern in a craft book. That easy! You'll tell us a little about the book, the project, how you personalized it, etc. Winners will be announced on Wednesday, October, 1! 2) Your craft book project must have been completed in 2014. 3) Create a new blog post, instagram, or Flickr photo (dated September 1, 2014 or later) and link or refer back to Craft Book Month at Craft Buds (#craftbookmonth for instagram) in your post or photo description. Make sure to list the craft book you used and provide a link if possible. Aww, what a cutie! You did a great job with both the kid and the shirt! Can't wait to see the other project you made (although technically, I already have seen it in person--just not finished)! Please, is there anything he doesn't look adorable in? Plus, you really can't go wrong with a dinosaur print.